Oracle has a very interesting suite of software, which has traditionally been available across many platforms, and supported by a majority of enterprise software applications. The "Oracle Standard" license agreements offer significant cost savings for Oracle licensing costs, but there are significant restrictions that must be adhered to. Standard Edition... The Real Applications Clusters option is not included with any Standard Edition versions prior to 10g. Customers who participate in Oracle's Update Subscription Service for the Standard Edition Database can upgrade to the 10g version of the product for the supported licenses. Also, Customers must use Oracle Cluster Ready Services as the clusterware; third party clusterware is not supported, AND Customers must use Oracle Automatic Storage Management to manage all data. Processor: When licensing Oracle programs with Standard Edition One or Standard Edition in the product name, a processor is counted equivalent to a socket; however, in the case of multi-chip modules, each chip in the multi-chip module is counted as one occupied socket. What is the implication to this? The majority of multi-core CPU's on the market are all Multi-Chip Modules! If you are running a POWER or Intel x64 multi-core processor, most of these chips would mean that the core must be counted as a socket. In effect, single socket quad core multi-chip modules would count as 4 socket machines in Oracle licensing terms. If the business is trying to save money implementing Linux on Quad-Core processors, it it important to understand whether they are Multi-Chip Modules or not. If this is the case, then the business may need to resort to single socket systems, tied together in a grid, or choose a different CPU architecture that does not require Multi-Chip Modules like some modern SPARC processors. Oracle is always the best place to go, in order to clarify some of these odd license stipulations. Multiple SPARC cores for Oracle has been a FREE LUNCH at the expense of SPARC customers. I don't know why it would prove interesting. It is not like the clock speed will double, as POWER5 to POWER6. Right now, the core multiplier is completely out-of-whack for the SPARC64 chips, just completely. Intel gets its quad-core "Tukwila" Itaniums out the door in June or July. The Tukwila chips should certainly get their scaling factor removed, but given that HP and Intel do not have a database software business, I would venture that Tukwilas might sneak by with a 0.75 scaling factor. There is a popular & competitive Microsoft SQL Server on those platforms. The scaling factor may remain, to just be competitive with Microsoft SQL Server. If the clock rate doubles, removing the scaling factor removal may be a reasonable thing, but I doubt the clock rate would double. various other Sparc, and other chips have a 100 VUP rating. ...it is hard to imagine a 16-core "Rock" UltraSparc-RK chip not being in the same range when it comes out sometime in the fall. I highly doubt a 16 core RK chip will be 16x faster than a SPARC64 V, VI, or VII core. This being the case, IBM cranking up the VUP rating would be completely "off the chain". I think this analyst clearly has mistaken expectations from either SUN or IBM. To be fair, Oracle should run a database benchmark test on each processor and come up with a literal scaling factor based on possible clock speeds of all processors and make the scale all relative to the performance of one machine that it picks as the gold standard. Even with the chart above, POWER would still have an advantage of scaling factor of 0.50 per core over SPARC64 due to IBM's incredibly high clock rate!!! This clearly demonstrates how far out-of-whack the pricing is for Oracle Databases on systems today. Former substantial cross-platform vendors like Informix and Sybase are not the large players, like they used to be, resulting in databases being closely aligned to Hardware or OS vendors. Most applications that require a third-party database will use a major commercial vendor, like: Oracle Database, IBM DB2, or Microsoft SQL. Oracle's continuing punishment of SUN and "giving the farm" away to IBM has always seemed odd, considering that IBM is a direct commercial competitor, while SUN's MySql is not a direct commercial competitor. The migration of Oracle RDBMS to IBM DB2 is something that IBM's professional services is something that they would LOVE to do, while there is no equivalent professional services group in SUN to move Oracle RDBMS to MySQL. It is just a matter of time before Oracle continues to modify their processor core scaling factors, since they are cutting their own throats by advocating platforms who have extremely strong competing databases... but perhaps that is why Oracle has been able to charge a premium for SPARC - because there was no serious database competition. The Oracle Database Licensing has CHANGED, Effective Date: March 16, 2009! The Enterprise Edition requires a minimum of 25 Named User Plus per Processor licenses or the total number of actual users, whichever is greater. In short, if you are licensing Oracle on one or a cluster of IBM systems running on (POWER5 or) POWER6 on platforms between 1-4 sockets AND you are paying for every user of the system (i.e. every help desk agent), then you are OK. If you are licensing Oracle on one or a cluster of IBM systems running POWER6 (or IBM System Z mainframes) and not paying on a per-user basis (regardless of the number of sockets per server)… and paying licensing on a Processor basis (with a core multiplier factor), then the licensing factor change will impact you. The following table holds the per-core or per-processor factor (extracted relevant CPU architectures for SUN & IBM.) The items in italics indicate a license change. Partitioning can help mitigate the cost factors in the licenses. Higher end Solaris platforms use SUN Dynamic Reconfiuration while lower end platforms can use SUN Solaris 10 Containers (capped) to help license mitigation. (i.e. if it is thought that you may be out of compliance on an internal SUN based system, you could move the Oracle Database into a Capped Solaris 10 Containier on the same platform) which has fewer processors available, while the rest of the processors could be available for the other application processes in another container. Hard partitioning physically segments a server, by taking a single large server and separating it into distinct smaller systems. Each separated system acts as a physically independent, self-contained server, typically with its own CPUs, operating system, separate boot area, memory, input/output subsystem and network resources. You would need to determine if you are using the POWER6 of a SystemZ processor, to understand exposure. Because the multiplier has increased, hard partitioning (LPAR, DLPAR, vPar, nPar) will not be able to directly limit your exposure - unless you implement fewer cores, to reduce your total number of cores, since each core will cost you more. The loss of a core, to bring your budget in-line, will result in a serious loss in CPU power (due to the high thread speed for the core) for a measly 0.25 multiplier increase in cost. Implementing partitioning under AIX may cost you more in IBM license fees, as well as orphaning a core or two, which may not be able to be realistically recovered in another application. SUN's investment into Linux, historically, to blunt Microsoft, has cut it's own throat since 2000. Without SUN's investment into Linux, UNIX like environments could have become irrelevant, however, with Microsoft's NT operating system release and IIS - so I think no matter what SUN did, it was a lose-lose situation... but SUN's backing of x86 Linux was a more strategic move than just ceding the position to Microsoft & x86, giving them a better position to compete later. SUN's more recent targeted investment into Debian Linux to endorse Ubuntu and now adopt a variant of Debian packaging, may be an attempt to stop the bleeding of Solaris into RedHat and create more "choice" - which helps keep Solaris relevant under x64. Is Linux needed needed on the T processors to compete with x64? Since the same software is available under Linux as it is under Solaris, perhaps not. I think the competition between the T and x64 processors is a more significant issue, with Linux impact. A single Solaris socket T processor no longer outruns Linux quad socket x64 processors on web serving workloads. If Web Serving is the typical Linux workload, then the SPECWeb indicates that the T processors have been outperforming x64 for years on a price/performance ratio, until benchmarks published just a few months ago (with a single socket T2 outrunning quad sockets x64... but now quad socket hex core Intel chips are pushing 25% higher performance over a single socket T2) making x64 Linux price competitive with Solaris & SPARC T.
If SUN can release a T processor for embedded consumer or network devices, I think Linux may be a requirement, or a significantly slimmed down Solaris, in order to compete. I think that SUN avoiding this space has been disastrous decision, seeing the Apple had become largely relevant again, through this angle. Some believe it is a "wild guess" to suppose the T family is profitable, but I think we can analyze the quarterly results to come up with a conclusion based closer to reality. SUN's product gross margins seem to float between 35% and 50%. It seems the T processors make up about 375 Million (in Q2-2009) vs non-T SPARC at about 700 Million. Everything else looks about equal. Take these two product sets (T SPARC, non-T SPARC), with increasing revenue on T and decreasing revenue on non-T, plot both against the Products gross margin... it looks like the T processors are not as profitable as the Non-T processors, but still reasonable. Clearly, SUN needs a refresh in the non-T processors (SPARC64 VII+ or RocK), to stabilize the downward trend, since this is the lion-share of the product revenue. The "Other Systems" trend, seems to be inversely proportional to the T SPARC revenues... this bothers me historically, since any growth in the T SPARC seems to be getting canceled out by this other legacy category over the past 2 years, but this legacy category does not really exist any longer, as a proportion of significant revenue, so I don't believe it is worth tracking, moving forward. If the T revenue can become in-parity with the non-T sales or supercede the non-T sales, then the unpredictability of SUN's quarterly profits & losses will be suppressed, improving the suitability for longer term investors. There have been rumors about IBM purchasing SUN for a number of days now. Where has SUN been competitive, where IBM would want to purchase them? Since 2007, SUN has dominated performance of SPECWeb 2006 in 1 socket - it takes 4 socket systems to edge out a 1 socket SUN T2 processor - and of course, you just buy a 2, 3, or 4 socket T2 system to crush competing results, by an order of magnitude. For most of 2008, SUN was at the top of the list for CFP2006 Rates in 1 socket. For all of 2008 and so far though 2009, SUN is at the top of the list for CFP2006 Rates in 2 socket. Since end of 2008 and so far though 2009, SUN is at the top of the list for CFP2006 Rates in 4 sockets. SPARC has been clearly very competitive FOR YEARS on a field where POWER had decided to not even compete. SUN has been very competitive in the Applications Arena. OpenOffice is a SUN led OpenSource project, which IBM rebranded as Lotus Symphony, and SUN rebrands as StarOffice. SUN has been very competitive in the Application Foundation arena. Most cross-platform enterprise applications are written in JAVA. SUN has been very competitive in Tape Storage. SUN and IBM are basically the only games in town for substantial tape storage. The American Government would probably demand a spin-off of something in the case of a merger. SUN has been very competitive in the OS arena. There is nothing in the market like Open Source Solaris, only Windows has a more complete CIFS Kernel API set than OpenSolaris for CIFS/SMB. Only OpenSolaris offers a very full featured file system like ZFS (other OS's like Apple are starting to port and adopt pieces into MacOSX.) Systems administrators being able to trace third party applications programaticaly using DTrace is unheard of in the industry. Considering the size of SUN and the resources of the competition, SUN has done fairly well, even if they have not been able to compete everywhere as effectively as those companies with deeper pockets such as IBM. The first part of this article described in some detail how real-world benchmarks of servers can show very startling results for some real world workloads. If you have been following the article, you will notice the comparison to the HP platform, which was based upon a hex-core Intel processor. One of the major issues with the HP platforms was tied around excessive use of rack space. 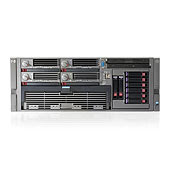 The HP ProLiant DL580 (a Compaq hold-over, from when Compaq was purchased by HP) was a very capable server, with 4 sockets, to hold the Intel Hex Core 7000 Series CPU's. For roughly the same price point, the SUN server will half the rack space and reduce the power & cooling requirements of the HP server. If you are sold on the Intel Hex-Core for your application load, an excellent servers solution was recently released: SUN Fire X4450. This short video, introduced an SMP server leveraging the Intel 7000 series Dual, Quad, and Hex-Core server. The SUN X4450 server brings Intel closer closer in line with the SUN SPARC Enterprise T5240 T2+ servers, providing the network management architect a closer choice when trying to find similar performance characteristics in a similar space requirement. A very nice piece of knowledge, for the data center which stores on-site spares: Many of the hardware spares (drives, power supplies, fans, boards, etc.) are can be interchanged between Intel & SPARC units of this family, providing lower maintenance costs. SPARC platforms normally scale linearly, as you add cores. This means, an architect can accurately predict costs and performance by adding sockets, cores and threads to an application in the same chassis by adding hardware or partitioning with LDOM's or Solaris 10 Containers. If disk space is not an issue and you are using external storage and you are looking for real-world compute power in a small space, SUN SPARC Enterprise T5440 T2+ servers provide ample throughput. A single SUN T5440 consumes 4U, in comparison to 4x SUN X4450 at 8U, and in comparison to to 4x HP DL580 at 16U. For highly threaded real-world applications, this server is very hard to beat. With the odd way application vendors choose to license on platforms (some with per-platform, others with per-socket, really whacked licensing per-core) - Hex Core and Octal Core may not be as beneficial, from a cost perspective. To demonstrate how to work through those issues with Intel based servers, sometimes the best way to deal with it is by purchasing less hardware. The Intel platforms normally do not scale linearly when you add cores and servers to clusters of Intel platforms. A more highly integrated socket with more cores may not perform equally as well (per core) a socket with fewer cores. The price/performance ratio per core basically rises for applications when the price/performance ratio per core basically lowers for server hardware. The greater amount of cache, on levels of cache closer to the processing units, will also increase single thread performance as well as throughput, due to decreased latency on cache hits. Also, robust bios/firmware capable of partitioning does not exist on Intel/AMD platforms, meaning partitioning must be done through an additional hypervisor with an additional cost (both in dollars as well as in system call performance.) If a larger Intel/AMD platform with more cores is purchased, even though the cores run at a slower speed, increasing the Application cost per core, Application cost is further degraded once a typical Intel/AMD hypervisor is added. These two issues significantly hinders the options for architects trying to build a long term solution which will scale while optimizing costs on Intel/AMD platforms. To try to deal with this Intel problem, server vendors leave CPU's with fewer cores in their product lines, even though the hardware costs do not differ significantly. To illustrate this, a single server may have a miriad of confusing consumer options for x64 processors, such as the Intel 7000 series based SUN Fire X4450. When working with a platform for managing networks, integrating systems through middleware, or presenting data to customers - web servers and encryption become extremely important. These two factors should be considered when choosing a platform. Network Management increasingly requires encryption and compression functions for transport protocols. Encryption is part of established protocols such as SNMPv3. Compression is common in proprietary protocols, where data is built on a foreign platform, shipped to the management platform (increasingly over encrypted HTTPS), and unbundled. Seasoned architects agree that the combination of encryption and web server performance becomes a key factor with scaling any application in large applications. Traditional benchmarks had surrounded CPU single thread performance in integer and floating point. Business applications were single threaded on desktops in the past, but modern applications are centrally deployed, driving the need for new benchmarks. Newer benchmarks had surrounded multi-threaded CPU integer and floating point performance. Newer high-throughput CPU's, such as the Hex Core 7000 Series Intel provide outstanding throughput in comparison to older Octal Core T2 SPARC Series. This is a better metric for measuring scalability of centrally deployed application, but this is beginning to be insufficient when modern CPU architectures include other embedded functionality to accelerate modern management applications with encryption and web serving requirements. Understanding the implications in platform choice in modern management application deployment has been lacking, until newer benchmarks have been made available. The SPECweb2005 benchmark is a good start. Viewing the high-end of the report, performance implications are astounding. Is the best platform to deploy applications on a hex-core Intel or an octal-core SPARC? The 4 processor Intel Xeon X7460 from vendors like HP will run you a similar cost to a 1 processor Sun SPARC T2 (i.e. low-mid $20K US$) - so it seems like a good possibility from price perspective. Probably not, if heat, cost, scalability, future growth, and rack space are considerations. The Quad-Socket Hex-Core Intel platforms are typically 4U-5U in height, while the Single-Socket Octal-Core SPARC platforms are typically 1U in height. The Quad-Socket Hex-Core Intel platforms are typically at their maximum number of CPU's, meaning a total of 8 sockets will mean 8U-10U in height, while the Dual-Socket Octal-Core SPARC platforms are typically 1U in height... but the Intel platform will require clustering hardware & software to take advantage of the additional capacity at lack of linear scalibility, while the SPARC platform will just scale linearly. The Quad-Socket Hex-Core Intel platforms are typically at their maximum number of CPU's, meaning a total of 12 sockets will mean 12U-15U in height, while the Quad-Socket Octal-Core SPARC platforms are typically 4U in height... but the Intel platform will require clustering hardware & software to take advantage of the additional capacity at lack of linear scalibility, while the SPARC platform will just scale linearly. The Quad-Socket Hex-Core Intel platforms are typically at their maximum number of CPU's, meaning a total of 16 sockets will mean 16U-20U in height, while the Quad-Socket Octal-Core SPARC platforms are typically 4U in height... but the Intel platform will require clustering hardware & software to take advantage of the additional capacity at lack of linear scalibility, while the SPARC platform will just scale linearly. To chart the space, price, and performance implications... I am using a discounted price for HP and straight retail prices for SUN, meaning the SUN will probably be much lower. It should be noted, the T2 and T2+ processors run 8 threads per core, meaning that single thread performance is slower than the single thread performance on the Xeon, while Opteron seems to have best single thread performance. If single threaded performance is a requirement, then this should be kept in mind. It is clear that the T2 & T2+ architecture is competitive today, while leading the market from the date of their initial release. The T2 and T2+ processors have been out for years, indicating that a refresh on this CPU line will probably be released soon, to compete with the brand new Intel hex-core processors released just months back. Considering how old the T2 processor line is and seeing how well it competes with modern processors on a price/performance basis, there is a good indication that the refreshed line will give a tremendous application performance boost, if you can delay hardware purchases until Q3 or Q4 of 2009 over the competition. When questions about Oracle licensing comes up, things can get rather puzzling. How is one to determine license liability? Sometimes, there are web pages which help to determine liability with single and multi-core processors. A T1 platform is a GREAT platform for deploying a basic development or test environment or a development or test clustering environment, where full fledged performance is not required, but binary compatibility is desired with SPARC applications. Building applications which scale well on a T1 platform will offer excellent performance when the application needs to scale up with larger number of cores or processors, since it will be more likely to scale linearly since the CoolThreads cores will scale linearly in performance. There is a lot of mis-information about partitioning flooding the internet. The best place to go for information regarding partitioning is Oracle's web site. The following document is dated from 2002 and is still posted as current, as of the publishing of this blog entry. As a result, soft partitioning is not permitted as a means to determine or limit the number of software licenses required for any given server. A server has 32 CPUs installed, but it is hard partitioned and only 16 CPUs are made available to run Oracle. The customer is required to license Oracle for only 16 CPUs. Very clearly, costs can be reduced by using Dynamic System Domains of high-end SPARC systems as well as Solaris 10 (capped) Containers on low-end to mid-range systems. With a T2 system being roughly twice the throughput of a T1 system, a low-end T2 makes a good production system which can scale up with a lower initial cost, leveraging hard partitioning options like LDOM's or Solaris 10 (capped) Containers. As greater performance is needed with applications, the appropriate number of cores can be added to a T2 system, in order to provide higher capacity in affordable quantities. The T2 may make a great consolidation platform for a Disaster Recovery platform, that could double as a Development Platform, by "scaling down" the number of cores in a container.